whose invention (1907) made the first telephoto transmission by wire, from Paris to Lyon to Bordeaux and back to Paris. 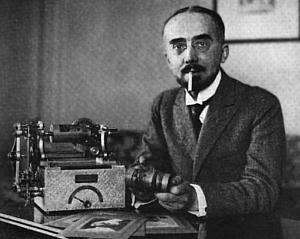 After further development, his Belinograph was able to make the first transatlantic radio facsimile transmission, on 4 Aug 1921. Facsimile of a Message, Sent From New York, Is Obtained in Seven Minutes in Paris. Matin Says Transmission Marks an Epoch in Science — Newspaper Pages Could Be Copied. Copyright 1921, by the New York Times Company. PARIS, Aug. 4.—An epoch-making achievement was recorded today when for the first time a written document was transmitted fac simile across the Atlantic Ocean by wireless telegraphy. It was a message written by C. V. Van Anda, managing editor of THE NEW YORK TIMES and addressed to the Matin in Paris. Transmission was effected by the Belinograph, which for some time has been used in Europe for the transmission of autographic messages and photographs. The process of sending this message was exactly the same as that of sending a photograph, and the successful receipt of the message is declared by Dr. Belin to mean that he will soon be transmitting photographs by wireless from one side of the Atlantic to the other. Today's message was received by a Belinograph installed at Malmaison, the French wireless station, and was sent by the Annapolis radio station. The Matin will publish it in the morning. The New York Timescongratulates Le Matin upon this new method of wireless transmission. “An event took place yesterday,” he writes, “which truly represents a great victory for French science and technique and which a few years ago would have been thought an unbelievable fairy tale - an autographic document was transmitted from the United States to Paris almost instantaneously and the words of the document written over there were received here just as they were written and were read here a few moments after being sent. “This document, which we are happy to present to our readers, is a message written by the hand of the director of a great American newspaper, THE NEW YORK TIMES. What is most wonderful in the transmission of this document from America, over 5,000 kilometers of the Atlantic Ocean is that it was sent by wireless alone and without the mediary of a cable. Since the Matin obtained the exclusive use of the invention of Dr. Belin for photographic and documentary reporting, we have many times presented to our readers photographs and autographs transmitted by this wonderful invention. These were sent by telephonic wires, and it was considered wonderful that we could transmit instantaneously and without deformation by telephone the lines of writing, finger prints and signatures over a single metallic wire. “Up to a few months ago it was believed impossible to make this transmission over distances as great as those which separate America and Europe, either by cable or wireless. However, since yesterday this double impossibility has become a reality, as this document shows, and truly it marks a date in the history of civilization, and one day this message will figure among historic documents. “From today the transmission of Belinograms has acquired an extension that is unlimited. It is no longer necessary to withdraw all other traffic from the cable to use it. Wireless will do. “This triumph of a French Idea was not obtained without difficulty, without long and tenacious efforts, due to the genius and industry of M. Belin and his aids, which the Matin is proud of having materially aided. “Just before the Dempsey-Carpentier match we asked Belin if it would be possible to send from Jersey City to the Matin a picture of the fight by wireless. ‘Impossible is not a French word.’ as Belin quoted Napoleon and he set to work. His preliminary test was encouraging. He sent from the Bordeaux wireless station to Paris a series of photographs and documents. “We have explained to the readers of the Matin the simple principle upon which is based the transmission of Belinograms. It consists in projecting upon a cylinder turning at great speed and bearing photographic paper a small ray of light, the intensity of which is controlled by a current coming from the sending station. This current is regulated by the shading of carbon upon the photograph to be transmitted. This photograph is rolled upon a cylinder at the sending station identical with another cylinder at the receiving station and turning at the same speed. “The waves of the wireless are alternating electric currents, transmitted without the aid of cable. The difficulty was to adapt Belin's instruments to the wireless currents as received upon the antennae. It was this difficulty which was overcome in the experiments between Bordeaux and Paris. “It remained to do over 5,000 kilometers what had been done over 600 kilometers. “Engineers were sent at once to New York. Unfortunately, on account of the delay of the ship they arrived on July 1, one day before the famous match. Twenty-four hours was really too little time to make the necessary arrangements with the American authorities to assure the collaboration of the wireless station at Annapolis and to install and regulate the instruments. In spite of heroic efforts, the Carpentier-Dempsey match could not be Belinographed. “In this relation it is interesting to recall that an English newspaper, The Daily Mirror, published the day after the match a photograph; but this photograph, although most interesting from a journalistic point of view, did not truly represent photographic transmission, but was more exactly transmission by cable. It had been worked out between the New York office and the London office of that newspaper that the different parts of the bodies of the two boxers should be shown on two kinds of squares, each of which should have numbers. In this way, by cabling to London the numbers corresponding to the photograph which they wished to send, they enabled the London office to reconstruct the photograph, which was reproduced. This process, though very ingenious, does not in the least resemble the solution of the problem reached by Belin. “A few days ago the Belinogram system was brought to the attention of the Interallied Wireless Commission over which General Ferrie presided. At the proposal of the General the whole commission went to the laboratory of Dr. Belin and saw on July 15 photographs sent from Bordeaux to Paris. Much moved, the American delegates gave immediate orders to New York wireless services to facilitate the interrupted trials. In that way yesterday about 5 o'clock we were able to receive the autograph message reproduced above. Image (not in original text) added from La France: an American magazine (1920), 5, 54. Text from The New York Times (5 Aug 1921), 3. 5 Mar - short biography, births, deaths and events on date of Belin's birth. 4 Aug - short history of Berlinogram transmission plus births, deaths and events on that date.